My Stampin Up club meeting is tonight! I was finally able to make my card for our monthly draw. I used the SU butterfly, the postage stamp, curly label and small oval punches. 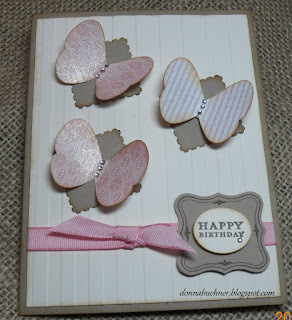 I hope you can see the shimmer paint that I sprayed onto the butterflies. The card is really nice in real time :) Oh and I also used my newest embossing folder textured impressions stripes! really like this one. Now I must scoot so I won't be late for the meeting! Great job, Donna! I like your you use the sketch but change it to suit your own idea. You are a very creative lady!!! It was a fun sketch to create from.